Black forest cakes are a favourite among many. Hence, if your dear one loves black forest cake then give him/her a pleasant surprise on Valentine’s Day by sending this 1 Kg eggless cake. 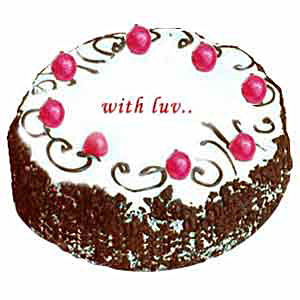 What makes this cake a perfect gift for this occasion is it has the words ‘ With Luv.....’ written on it. Since this cake will be delivered from a renowned bakery, you can be sure about its taste and quality. Your dear one in all cities in India will be thrilled with this gift from you. Thus, send this delicious cake to your dear one through GiftsAcrossIndia.com and make his/her day really special. You can also couple and send this cake with other Gifts across India. Please note that the picture is indicative.